VISIT DENVER will go the extra mile for you to make planning your event as simple as possible. And, with all the convenient hotels, a walkable downtown, exciting entertainment, diverse cultural attractions and culinary offerings Denver offers, you're sure to find what you're looking for in the Mile High City. 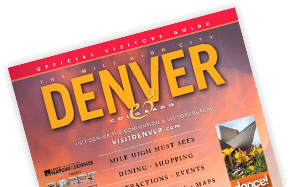 Downloadable email templates, postcards, travel and dining guides, photos and more that show why Denver is one of the most desirable U.S. cities to visit. Find great deals on dining, attractions, and shopping with our discount coupons. VISIT DENVER wants to hear from you. Please do not hesitate to contact us if we can be of service.